Allulose and Palatinose recently have come onto the scene. They satisfy the sweet tooth and provide a variety of health benefits. The world of alternative sweeteners is filled with products that mimic the sweetness and taste of sugar but with fewer calories. Alone or in combination, they provide a satisfactory taste experience. However, because many don't resemble sucrose structurally, they can't replace the bulk or functionality of sugar and often are combined with other nutritive ingredients such as starches that add calories. Two sweeteners in particular that recently have been introduced to the marketplace in a variety of products are psicose (allulose) and isomaltulose (Palatinose). The appeal of these sweeteners is their ability to provide sweetness along with sucroselike functional and metabolic benefits not delivered by most nonnutritive sweeteners. The names psicose, D-psicose, allulose, and D-allulose are used interchangeably to describe a naturally occurring "rare" sugar. 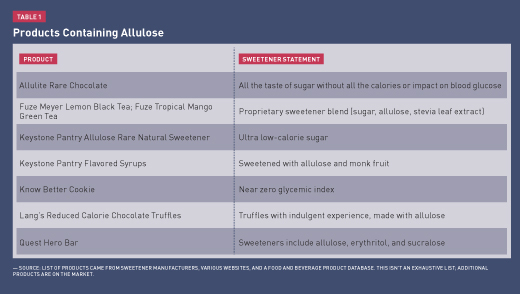 Allulose, a monosaccharide, is present in very small amounts in a diverse group of fruits and nutritive sweeteners, including figs, raisins, jackfruit, maple syrup, molasses, and brown sugar. Commercially, allulose is produced through enzymatic conversion of a carbohydrate in corn, sugar cane, beets, or other sources. The resultant sugar is about 70% as sweet as sucrose and resembles sucrose in taste, texture, and function. The science regarding its health benefits and impact on blood sugar, including studies as part of the product's Generally Recognized as Safe (GRAS) application, demonstrates that allulose is nonglycemic; that is, it has no effect on blood glucose. "We do not see an effect in individuals who handle blood glucose normally," says John Sievenpiper, MD, PhD, FRCPC, an associate professor in the department of nutritional sciences at the University of Toronto and staff physician in the division of endocrinology and metabolism at St. Michael's Hospital in Toronto. "This contrasts with our results from studies on individuals with impaired handling of blood glucose." Sievenpiper adds, "We need longer-term studies on longer-term effects to understand if what we see acutely translates into a sustainable advantage. Data suggest that allulose may improve the body's metabolic handling of high-glycemic carbohydrates, but it is too early to tell. In the meantime, we have not seen any harm." Allulose is suitable for individuals with diabetes. "In acute studies on subjects with type 2 diabetes or impaired handling of blood glucose, ingestion of allulose not only does not affect blood glucose but also improves metabolic handling and lower glycemic response of high-glucose carbohydrates," Sievenpiper says. "It activates the enzyme glucokinase in hepatocytes, promoting glycolysis by increasing conversion of glucose to glycogen." Clients and patients will need guidance from a dietitian on monitoring carbohydrates in foods and beverages containing allulose. Because it's a sugar, allulose counts toward grams of total carbohydrate and total sugars on the label, but impacts calories only minimally, if at all. The packaging for Quest Hero Bars, for example, educates consumers on how to subtract allulose carbohydrates from total carbohydrates. Research also suggests that allulose enhances fat oxidation. In one study, a group of healthy men and women experienced significantly greater postprandial fat oxidation, higher free fatty acids, and lower plasma glucose, but lower carbohydrate oxidation, after a 5 g dose of allulose followed by a standard meal as compared with a control of 10 mg aspartame plus the same meal.7 A preliminary study comparing a sucralose placebo to low- (4 g D-allulose twice daily) and high- (7 g D-allulose twice daily) allulose groups observed significant reductions in body fat percentage and body fat mass in both allulose groups and significant decreases in BMI and total abdominal and subcutaneous fat in the high-allulose group as compared with the placebo group.8 The research team calls for validation of the results through additional body fat testing. In food applications, allulose replicates sugars. "Not only does allulose help displace calories and reduce sugars, it can be used as a one-to-one replacement with similar functional properties but not calories," Sievenpiper says. "Nonnutritive sweeteners require the addition of starches and other ingredients to replace the bulk of sugar, and these contribute extra calories." Allulose can be added to foods by itself or together with other sweeteners. Like sugar, it browns during baking. GRAS uses include a wide variety of foods, among them yogurt, ice cream and frozen desserts, pudding, baked goods, jams and jellies, candies, and chewing gum. It also can provide mouthfeel without calories to diet and light beverages. Palatinose, generically known as isomaltulose, is a fully digested, slow-release glucose-fructose disaccharide. Discovered in Germany in 1957, isomaltulose occurs naturally in small amounts in honey and sugar cane juice. It's manufactured for commercial use from sugar beets through enzymatic strengthening of the glucose-fructose linkage in sucrose. This converts the α-1,2-glycosidic bond in sucrose into an α-1,6-glycosidic bond that's stronger, more stable, and broken down more slowly by digestive enzymes. 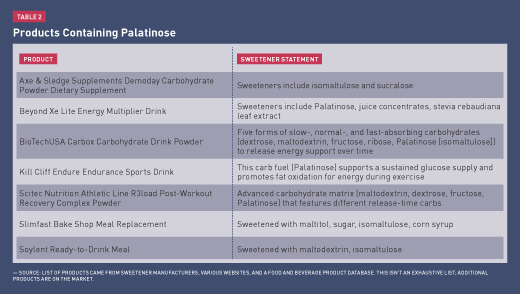 Palatinose has a similar taste profile to sucrose but gram for gram is about half as sweet. Palatinose also has been shown to promote higher fat oxidation compared with higher-GI carbohydrates.15 Enhanced fat oxidation may spare glycogen and therefore boost endurance during longer-term activities. Among a group of male cyclists, endurance and performance during a timed trial improved following Palatinose consumption compared with maltodextrin.16 The cyclists also had higher blood glucose concentrations during exercise and higher fat oxidation. Moreover, research shows Palatinose is suitable for individuals with diabetes. "The slower yet complete digestion and absorption of Palatinose is characterized by a slower, longer-lasting, and steadier blood glucose response, without the significant drops in blood glucose associated with conventional higher-glycemic sugars," says Daniel König, MD, a professor at the University of Freiburg (Germany) department of nutrition and Institute for Sports and Sport Sciences. "Studies show that Palatinose reduces postprandial glucose and insulin concentrations by up to 50% compared with high-GI carbohydrates. This evens out peak glucose levels, high insulin peaks, and low blood sugar levels in individuals with insulin-dependent type 1 or non-insulin-dependent type 2 diabetes." Lower insulin concentrations also may benefit weight loss by leading to enhanced fat breakdown and oxidation in skeletal muscle. Finally, Palatinose replicates sugars in food applications. Globally, Palatinose is used as an ingredient in a growing number of foods and drinks and is suitable for sports and fitness foods, beverages and supplements, instant beverages, functional dairy drinks, tea, cereal and energy bars, baked goods, meal replacement drinks, and specialty clinical nutrition products. Allulose and Palatinose both show promise as sweeteners with functional benefits that go beyond their sweetening characteristics. Although not yet widely available in stores, products containing allulose or Palatinose can be purchased through online retailers. However, the higher costs of these products and their limited availability may prevent consumers from trying them and repurchasing them regularly in the immediate future. 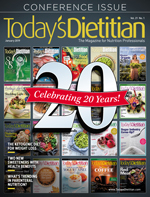 — Mindy Hermann, MBA, RDN, is a New York-based food and nutrition writer. 1. Williamson P, Schunk T, Woodyer R, et al. A single-dose, microtracer study to determine the mass balance of orally administered, 14C-labeled sweetener in healthy adult men [published online April 1, 2014]. FASEB J. doi: 10.1096/fasebj.28.1_supplement.lb450. 2. Iida T, Hayashi N, Yamada T, et al. Failure of d-psicose absorbed in the small intestine to metabolize into energy and its low large intestinal fermentability in humans. Metabolism. 2010;59(2):206-214. 3. Iida T, Kishimoto Y, Yoshikawa Y, et al. Acute D-psicose administration decreases the glycemic responses to an oral maltodextrin tolerance test in normal adults. J Nutr Sci Vitaminol (Tokyo). 2008;54(6):511-514. 4. Braunstein CR, Noronha JC, Glenn AJ, et al. A double-blind, randomized controlled, acute feeding equivalence trial of small, catalytic doses of fructose and allulose on postprandial blood glucose metabolism in healthy participants: the Fructose and Allulose Catalytic Effects (FACE) Trial. Nutrients. 2018;10(6):750. 5. Hayashi N, Iida T, Yamada T, et al. Study on the postprandial blood glucose suppression effect of D-psicose in borderline diabetes and the safety of long-term ingestion by normal human subjects. Biosci Biotechnol Biochem. 2010;74(3):510-519. 6. Noronha JC, Braunstein CR, Glenn AJ, et al. The effect of small doses of fructose and allulose on postprandial glucose metabolism in type 2 diabetes: a double-blind, randomized, controlled, acute feeding, equivalence trial. Diabetes Obes Metab. 2018;20(10):2361-2370. 7. Kimura T, Kanasaki A, Hayashi N, et al. d-Allulose enhances postprandial fat oxidation in healthy humans. Nutrition. 2017;43-44:16-20. 8. Han Y, Kwon EY, Yu MK, et al. A preliminary study for evaluating the dose-dependent effect of d-allulose for fat mass reduction in adult humans: a randomized, double-blind, placebo-controlled trial. Nutrients. 2018;10(2):160. 9. Kawai K, Okuda Y, Yamashita K. Changes in blood glucose and insulin after an oral palatinose administration in normal subjects. Endocrinol Jpn. 1985;32(6):933-936. 10. Maeda A, Miyagawa J, Miuchi M, et al. Effects of the naturally-occurring disaccharides, palatinose and sucrose, on incretin secretion in healthy non-obese subjects. J Diabetes Investig. 2013;4(3):281-286. 11. Henry CJ, Kaur B, Quek RYC, Camps SG. A low glycaemic index diet incorporating isomaltulose is associated with lower glycaemic response and variability, and promotes fat oxidation in Asians. Nutrients. 2017;9(5):473. 12. König D, Theis S, Kozianowski G, Berg A. Postprandial substrate use in overweight subjects with the metabolic syndrome after isomaltulose (Palatinose™) ingestion. Nutrition. 2012;28(6):651-656. 13. van Can JG, van Loon LJ, Brouns F, Blaak EE. Reduced glycaemic and insulinaemic responses following trehalose and isomaltulose ingestion: implications for postprandial substrate use in impaired glucose-tolerant subjects. Br J Nutr. 2012;108(7):1210-1217. 14. Sridonpai P, Komindr S, Kriengsinyos W. Impact of isomaltulose and sucrose based breakfasts on postprandial substrate oxidation and glycemic/insulinemic changes in type-2 diabetes mellitus subjects. J Med Assoc Thai. 2016;99(3):282-289. 15. Maresch CC, Petry SF, Theis S, Bosy-Westphal A, Linn T. Low glycemic index prototype isomaltulose — update of clinical trials. Nutrients. 2017;9(4):381. 16. König D, Zdzieblik D, Holz A, Theis S, Gollhofer A. Substrate utilization and cycling performance following palatinose™ ingestion: a randomized, double-blind, controlled trial. Nutrients. 2016;8(7):390. 17. Oizumi T, Daimon M, Jimbu Y, et al. A palatinose-based balanced formula improves glucose tolerance, serum free fatty acid levels and body fat composition. Tohoku J Exp Med. 2007;212(2):91-99. 18. West DJ, Morton RD, Stephens JW, et al. Isomaltulose improves postexercise glycemia by reducing CHO oxidation in T1DM. Med Sci Sports Exerc. 2011;43(2):204-210. 19. Bracken RM, Page R, Gray B, et al. Isomaltulose improves glycemia and maintains run performance in type 1 diabetes. Med Sci Sports Exerc. 2012;44(5):800-808. 20. West DJ, Morton RD, Bain SC, Stephens JW, Bracken RM. Blood glucose responses to reductions in pre-exercise rapid-acting insulin for 24 h after running in individuals with type 1 diabetes. J Sports Sci. 2010;28(7):781-788. 21. Kendall FE, Marchand O, Haszard JJ, Venn BJ. The comparative effect on satiety and subsequent energy intake of ingesting sucrose or isomaltulose sweetened trifle: a randomized crossover trial. Nutrients. 2018;10(10):1504. 22. Food and Drug Administration, HHS. Food labeling: health claims; dietary noncariogenic carbohydrate sweeteners and dental caries. Final rule. Fed Regist. 2008;73(102):30299-30301.